I’m in the backyard I’d spent my childhood in. I can hear the buzz of mosquitoes in my ear, and feel the cool breeze that carried the scent of bovine flatulence on my face. The lucid part of my brain—the part that remains separate even when dreaming—notes the lack of cicadas. For better than ten years I’ve lived in North Carolina, where the cicada’s metallic buzz provides a never-ending counterpoint to every other night sound. But right now, in my dream, I’m back in Cody, Wyoming. And I’m listening to the rodeo. In a few years the rodeo grounds will move to the edge of town, but right now it’s just a few blocks away from my house. Its lights create a false sunrise over the tall fence surrounding our yard, and the sounds of excited people and irritated bulls carry clearly. I’ve been to enough rodeos that I can close my eyes and picture what’s happening. A dip in the crowd noise means the next bull rider is in the chute—a tiny metal cage just barely wide enough to accommodate the two-ton bull. 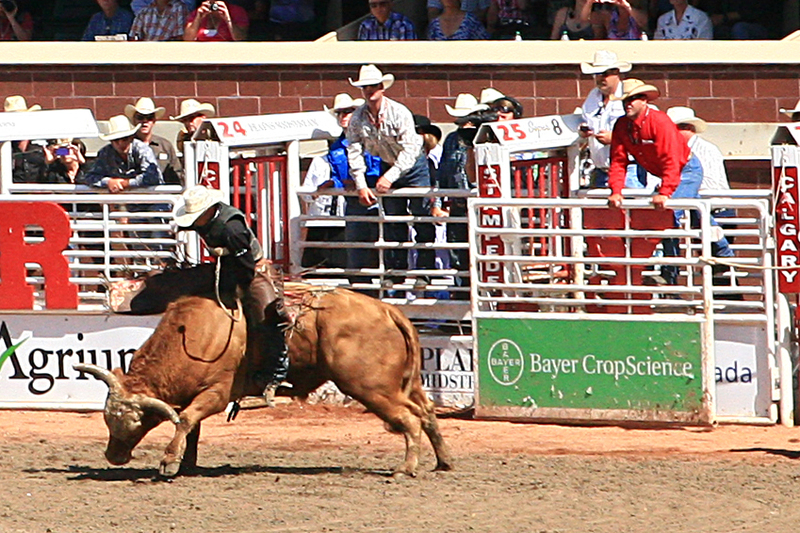 The rider’s lowering himself onto furious animal, wrapping a thick rope around his right hand. Things can go wrong badly and in the blink of an eye in that cage. A sudden rush of noise from the crowd means that the gate has opened. The bull is out, throwing the back end of his body high into the air, twisting wildly, bucking with the single focus of throwing the rider onto the hard-packed dirt. I can judge how the ride is going by the noise. 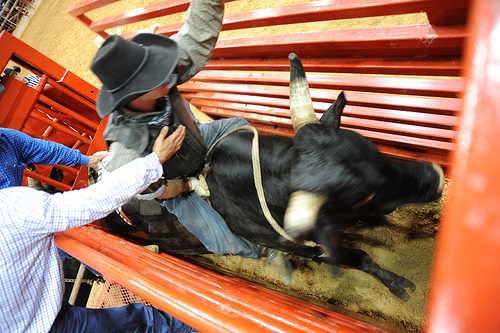 High volume and lots of excitement means the bull is bucking and twisting for all he’s worth—it’s a good ride. An extended “oooh” means the rider has come off the bull, whether he hit that magic eight seconds or not. Silence after that means the rider came off and the bull stomped him or got him with those blunted horns. It means the rodeo clowns are out there distracting the bull so the rider has a chance to get out. It’ll stay silent until the rider stands up and waves his hat to signal he’s OK (even if he’s got a few broken bones he didn’t have before), or until the rider waves from the stretcher. This post is my response to a prompt from Write On Edge – we were supposed to write something in which a local item or industry plays a role. Where I grew up, rodeos were a part of life. One of my first (unofficial) jobs, was climbing all over the stands with a friend of mine, selling programs. I chased sheep in the center of those grounds, watched barrel racing, and closed my eyes a lot when those brave men strapped themselves to two tons of pissed-off bull. Thank you for stopping by, and please, let me know what you think in the comments! There is just something about rodeos isn't there? I''m not much of a cowgirl or anything, but if I see bullriding on the TV, I stop to watch. Maybe it's because of the insanity of it. A man gets on a huge beast that is going nuts. Great post for the prompt. That's the perfect take on the prompt. And from the POV from someone living near it... knowing what the sounds mean without even seeing the action... perfect. I've never been to a rodeo, but I felt like I could see it and hear it thanks to your descriptions, including the tension that rises before the cowboy gets up from the ground.